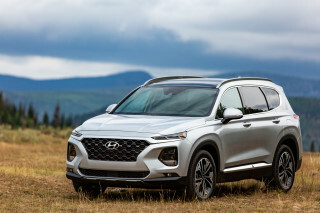 In the fine tradition of naming vehicles after places in the American West — Cheyenne, Colorado, Sequoia, Silverado, Sedona, and Tacoma come to mind — Hyundai’s new compact sport-utility vehicle, now on sale, is called the Tucson. Never mind the fact that it’s also a college town with a progressive and quirky — albeit outdoorsy — edge. And near the famous Sonoran desert and its distinctive saguaro cacti, which I once saw almost mythologically covered in snow. Well, Tucson the vehicle isn’t exactly the edgy standout, but it rather lands Hyundai smack in the middle of the compact SUV market on the first try, and of course with a value equation that will knock your Tevas off. The Tucson is in a very competitive vehicle segment. 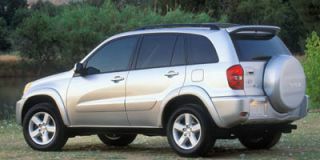 Some of its many competitors are the Chevrolet Equinox, Ford Escape, Honda CR-V, Toyota RAV4, Saturn VUE, and Subaru Forester. Like all of these other class competitors, the Tucson is car-based. 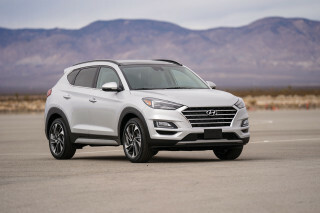 The compact SUV is built on a “heavily modified Elantra platform” (Hyundai’s small sedan/hatchback), though it is a new vehicle and offers a V-6 engine that’s not offered in the Elantra. And it also fills a product void left open a few years ago when the Elantra wagon was discontinued. All engines in the lineup are designed and made by Hyundai (just a few years ago, Hyundai still sourced engines from Mitsubishi). The base Tucson, which we did not get a chance to drive, is powered by a 2.0-liter four-cylinder engine making 140 horsepower. It has variable valve timing for better low-rev response, and is the same engine that still powers the Elantra and was previously standard on the base Santa Fe. In the Santa Fe, it was embarrassingly underpowered, but in the Elantra it provides rather sprightly performance. In the Tucson, we wager it’ll be somewhere in between, probably barely adequate with light loads and sluggish with full loads. 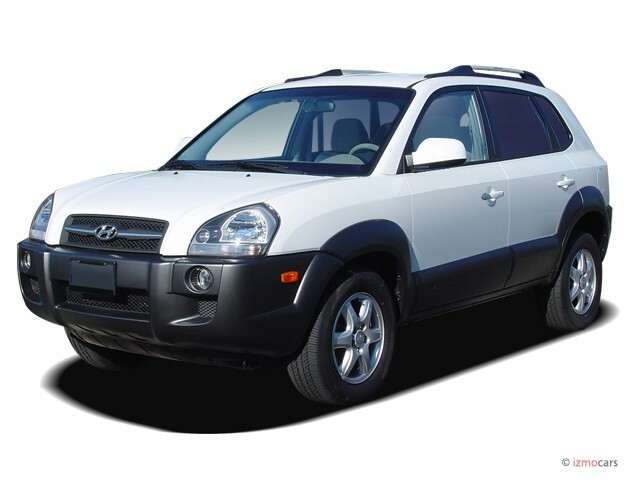 In recent years, many Hyundai/Kia models have been criticized as being several hundred pounds heavier than similar-sized competitors, so Hyundai officials were proud to note that through the use of more advanced materials the Tucson’s curb weight is actually less than several vehicles its size. The 2.7-liter V-6 — the same one that’s offered in the Santa Fe and Sonata — is the top-line engine in the Tucson. It feels sprightly most of the time and still adequate with a full load. With 173 hp, it’s not an especially powerful or torquey engine by modern V-6 standards, but it delivers its power smoothly through the four-speed automatic transmission (the only one available in V-6 models). Deceiving is the throttle calibration, which is very aggressive, at first making you think that the V-6 is much more powerful and torquey — and no doubt a selling point on the test drive. We were quite impressed with the level of powertrain refinement and isolation. Ratios in the transmission seem well chosen, but in general the V-6 is geared tall, presumably for lower revs, less noise, and optimal fuel economy. However, this does mean that the transmission has to downshift to third gear for even slight grades, and that gap between gears is rather large. But the transmission responds well to the need for more revs. On long grades, it keeps the lower gear until level again, eliminating the horrible “hunting” behavior that plagues many small cars and SUVs powered by small four- and six-cylinder engines and automatic transmissions. Manumatic-type control is included with the automatic transmission, in the form of a separate +/– gate. Overall, the Tucson rides very well, free from the pitching motions that short-wheelbase vehicles tend toward, and it feels well isolated from the “buzz” of rough pavement surfaces and “jolt” from expansion strips. In a short stint with a full load of people, we noticed that more weight brought some more impact harshness to the ride. At least compared to the competition, the Tucson’s steering and handling isn’t its strong suit. In everyday driving it’s fine, but if you push the Tucson into a corner a little too fast, there’s a disconcerting softness and body motion that you have to anticipate. 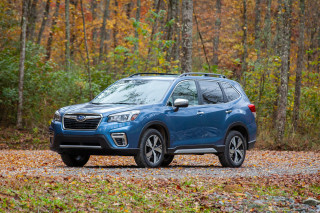 The standard anti-lock brakes — discs front and back — have fine stopping power but they lack the sort of positive feel that competitors like the Subaru Forester offer. 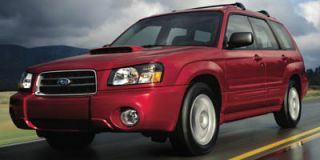 Both the Forester and the Ford Escape offer much sharper, more precise handling and steering while being only slightly worse in the ride quality department. The packaging seems a little chunkier (and perhaps macho) from the outside than most other carlike SUVs. Hyundai said that one of the aims in designing the vehicle was to give it a wide, stable stance. For those coming from either a car or a more traditional SUV, the driving position is a little different. It’s upright, high, and forward but with a steeply raked carlike windshield. The roofline tapers down in the back, and the rake of the back window means that the practical cargo area isn’t quite as large as you might expect. The rear seats fold forward easily, though, for more flat-loading “thing” space. Everyone’s paying more attention to interiors now, and so the Tucson has a comfortable, mostly attractive interior that would have been passable for a luxury brand just a few years ago. Gauges and controls are simple and standard. The dash materials are a nice matte material, and GLS models upgrade to grained matte-silver trim inserts for the center stack area. The exception to the plain but likeable interior is the cloth upholstery, which is a sort of light gray-beige with an embroidered greenish pattern within. The upholstery was almost unanimously disliked by fellow journalists; one described it as being similar to a 1970s lampshade or couch. Front seats are typical for a budget-priced Korean-brand model — comfortable for the short-to-average driver, but skimpy for tall or obese occupants. 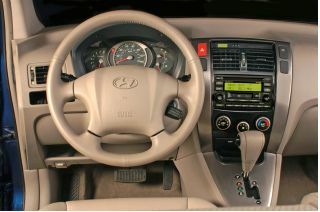 The driver’s seat adjusts for height and tilt with two rotary dials on the side. The rest of the package is pretty standard for a small SUV. The back seats are a little low, so adults tend to sit with their knees slightly elevated and apart. There’s really just room for two adults in back. Pity the poor person who has to sit in the middle; it’s not as claustrophobic as a small sedan, but the rather narrow cabin will leave adult-size occupants jousting elbows and shoulders. Considering Hyundai’s newfound reputation for quality, we were surprised to find a few niggling initial-quality issues in our test cars, which were from the regular production run. We briefly drove a high-end LX with the optional ($750) sunroof, which takes away a couple of inches of headroom and brought much more wind noise than expected at highway speeds. We tried several times to seal it and finally found that closing the interior cover could mute it somewhat. In another test vehicle, the intermittent wipers would hang up halfway across the windshield in intermittent mode. Finally, fit and finish for the interior trim pieces could have seen better attention. Now that new Hyundais are becoming legitimate competitors to new (rather than used) Hondas and Toyotas, these are things we need to pay attention to. But even though the Tucson is no standout performer, and there are a few niggles, the number of high-value features offered on the Tucson might really tip shoppers’ scales. Where the Tucson shows strongest feature-wise is in the safety department. All Tucsons — even the $17,999 base model — come with anti-lock brakes and a stability control system. 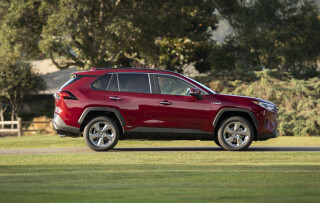 It’s the first such system to be standard in a compact SUV. Furthermore, kudos to Hyundai for seeing that all Tucsons include six airbags, including driver and passenger front airbags, side curtain-type head airbags, and side-impact bags. The base-level, four-cylinder GL includes anti-lock brakes, stability control, air conditioning, heated mirrors, keyless entry, a rear wiper, 16-inch alloy wheels, and an impressive AM/FM/CD audio system with six speakers. 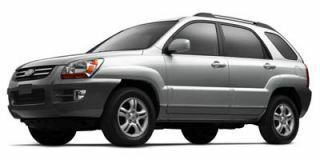 The mid-level, upmarket GLS model, which we spent the most time in, starts at $19,999 and adds the V-6, leather trim, fog lamps, metal-grain trim, and some other trim add-ons. The optional BorgWarner all-wheel-drive system sends nearly 100 percent of power to the front wheels during normal driving, and it relies on a small amount of front wheel slip before it diverts power as needed to the rear wheels. The all-wheel-drive system has a “4WD LOCK” setting, which locks the center differential into a 50/50 torque split front-to-back. Adjacent to that button is one to turn off the ESP stability control. Both switches may come in handy in situations with a soft, predictable surface such as sand or deeper snow, but otherwise the driver should leave them on. With nearly any vehicle that could be called an SUV, some type of off-road ability — whether it will ever be used or not — seems to be requisite. In a presentation to the press, Hyundai officials were quite fond of the term “scrappy” in describing the Tucson’s off-road abilities. Ground clearance is a competitive 7.8 inches, with an approach angle of 28.2 degrees and a departure angle of 31.9 degrees. The Tucson’s all-wheel-drive system gives plenty of ability for traction-challenged situations, and its strengthened suspension is up to the task, but on rutted logging trails the lack of wheel articulation left us with comparisons to a cocktail shaker. Squeaks and rattles were impressively absent despite the harsh motions. From a brief look underneath, the Tucson doesn’t appear to have the proper under-body protection for frequent trail driving. The larger Sonata-based Santa Fe is due for a full redesign for next year and will become larger to take on the Honda Pilot and Toyota Highlander head-to-head, but for now (this current model year) the size difference between the two vehicles is quite negligible. 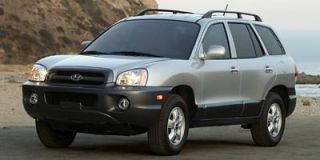 Hyundai points to the Santa Fe’s higher towing capacity in 3.5-liter trim as a reason to still opt for that vehicle. Incidentally, as Kia and Hyundai are owned by the same parent company in Korea but have separate U.S. sales organizations, Kia will be selling a very similar vehicle on the same platform as the new Sportage. 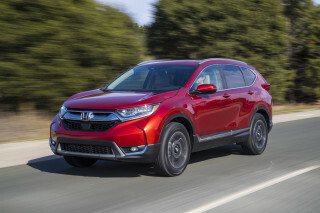 It will sell at around the same price, equipped with a similar level of equipment, but styled more toward the sporty and rugged than the luxurious. Either as an activity vehicle for young singles, or as a small family vehicle on a budget, with stability control, anti-lock brakes, side airbags, and the V-6, the Tucson is a steal. 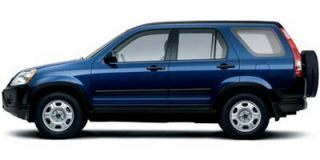 Those activity-minded folks might want to shop around a little, but for a small family or second vehicle, purely in terms of sticker price and features, you’ll have a hard time finding a better deal, around Tucson or anywhere else. A reliable set of wheels that gets the job done.